A large number of snakes were released this evening in an encampment of supporters of the Thai neo-fascist movement, Pitak Siam. A report of the incident can be found on the extreme rightwing Manager website here. The report says that someone dropped a bag of snakes near a group of fanatical Buddhists known as the Dhamma Army, who are aligned with Pitak Siam. The species of the snakes is not known and nor is it known if they are poisonous or not. Pitak Siam are an extreme rightwing movement run by a group of elderly generals and supported by Abhisit Vejjajiva's "Democrat Party". They are staging a protest this weekend in Bangkok to further their aims of destroying Thai democracy, removing the democratically-elected Yingluck Shinawatra-led government and shutting down, or "freezing", Thailand for five years. The snake incident recalls a famous threat made by the Red Shirt-aligned militant renegade Thai Army officer, Major General Khattiya Sawasdipol aka Seh Daeng. In a 2008 interview with the Straits Times journalist Nirmal Ghosh, Seh Daeng had threatened to throw snakes from a helicopter onto the neo-fascist Yellow Shirt PAD movement. Seh Daeng was assassinated in 2010, most likely by one of his former Thai Army colleagues. Not sure if this counts as nonviolent action or not. Discuss. Nice story, but I don't trust it. I thought many Thais were used to getting snakes delivered to the front door during flood season. Also I got the impression that monks in monastaries are constantly surrounded by all sorts of fauna and make efforts to co-exist. Nigeria and India regularly have 'attempted murder by snake' stories. 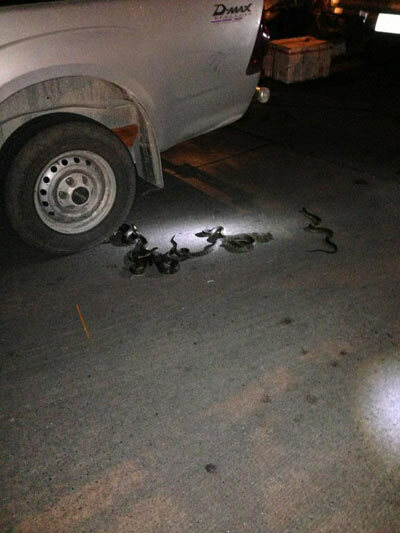 Shows how necessary and effective these anti-snake cops are.